Laminins are extracellular glycoproteins that form heterotrimers of various combinations of a, P, and y subunits that in vertebrates combine to form at least 15 distinct laminins (see ref. 69 and Chapter 1). These heterotrimers assemble into cross-shaped structures consisting of a long a and short P and y chains, making up each arm of the cross70-72. Generally the laminins have conserved domains with either matrix assembly or cell-binding activities. The short arms are often involved in cell matrix assembly and binding while the long a chain can bind to cell surface receptors by either the N- or C-terminal end of the cross. The long a chain may also bind and assemble matrix through an N-terminal globular domain that is present in many, but not all, members of the a chain family. Laminins play multiple roles in vertebrate development, being expressed at very early time points in the embryo. They mediate potent effects on neurite outgrowth, are required for the overall organization of the cortical layers, and play a role in many stages of the brain formation and development69,73,74. Because of these early and strong effects of laminins, it had been difficult to tease out their role in CNS synaptogenesis. Like agrin, laminins are known to play an essential role in proper synapto-genesis at the neuromuscular junction75-78. There, P2 chain-containing laminins bind directly to the presynaptic P/Q- and N-type calcium channels and induce their clustering, which in turn recruit other presynaptic components. Surprisingly, recruitment occurs independent of Ca2+ influx via the channels75. Perturbation of laminin-channel interaction in vivo results in disassembly of neurotransmitter release sites, active zones, resembling defects previously observed in an autoimmune neuromuscular disorder, Lambert-Eaton myasthenic syndrome. These abnormalities correlate with physiological defects in quantal release and use-dependent modulation of synaptic transmission at the NMJ79. Earlier in vitro study of ciliary ganglion neurons also showed induction of presynaptic structures by recombinant P2 fragments in the absence of a postsynaptic cell80. Thus, it appears that the P2 laminin is capable of initiating a complex set of changes in axons that leads to presynaptic differentiation. Since the N- and P/Q-type calcium channels, to which P2 laminins bind, are widely expressed in CNS, laminins are good candidates to initiate assembly of presynaptic zones in central synapses. P2 chain-deficient mice81 also suggest that laminins are important for alignment of pre- and postsynaptic sites. In the normal retina, rod photoreceptors make synapses, called triads, in which three postsynaptic elements invaginate into the base of the photoreceptor such that two horizontal cell dendrites lie laterally, and one bipolar cell dendrite lies centrally. However, in the P2 chain-deficient animals, another type of synaptic configurations, dyads, with only one or two horizontal cell processes apposed to the presynaptic specialization (ribbon), are most common. Also unusually common are floating synapses, wherein a fully formed ribbon, is seen without any postsynaptic element apposed. Further evidence for the role of laminins in the CNS comes from studies of one of the main laminin receptor classes, the integrins. While there are various laminin receptors including dystroglycan, lectins, and proteoglycans, integrins are the most prevalent and well-studied receptors. As mentioned in Section 3.2, integrins are a family of a and P subunit heterodimeric cell surface receptors expressed throughout the nervous system74 that mediate a variety of neuronal developmental and functional processes. Integrins a8, avP8, and a3 have all been directly localized to synaptic sites in CNS82,83. Since both RGD peptides that block interaction between integrins and their ligands and antibodies to P1 integrins interfered with formation of synapses in organotypic slice cultures, these integrins have been suggested to play a role in synaptogenesis23. More evidence on synaptogenic activity of integrins came from a recent work of Hama and colleagues 84 that shows changes in the synaptogenic state of a neuron in response to local contact with astrocytes. Astrocyte contact triggers integrin-mediated activation of protein kinase C throughout the neuron (see Chapter 21). This mechanism may provide a global enhancement of synaptogenesis. This study suggests that integrins may not directly mediate synaptogenesis by acting as cell adhesion molecules at the synapse itself, but rather may act as signaling molecules that change a neuron from either a quiescent or outgrowth state to a synaptogenic state. Such a role would be consistent with some of the known functions of ECM molecules as modifiers of cell function and adhesion through alteration of other adhesion proteins and cell signaling pathways. This study and others85-88 begin to address a critical, yet poorly understood aspect of CNS synaptogenesis. Namely whether the timing of synapse formation is intrinsically determined by properties of interacting neurons or it may also depend on extrinsic factors such as the ECM. These studies strongly suggest that environmental or ECM signals can have important effects on the timing of CNS synaptogenesis. Interestingly, during later stages of synaptic development, integrins proved to be necessary for maturation of excitatory hippocampal synapses, converting immature hippocampal synaptic contacts, which express the NR2B subunit of NMDA receptors and have a high glutamate release probability, into mature synapses, which lack NR2B and have lower release probability21. 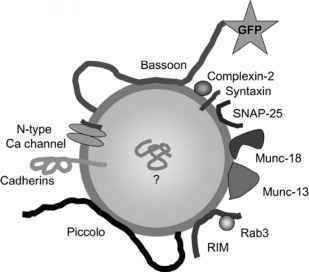 Furthermore, numerous studies demonstrated the important role of integrins in synaptic plasticity (for review, see ref. 8).